WASHINGTON — Secretary of Veterans Affairs Eric Shinseki, who has been sharply criticized by the American Legion and members of Congress over long delays in providing service to veterans at VA hospitals, announced his resignation on May 30. Shinseki, a Vietnam veteran and former Army chief of staff, had served as VA secretary since the beginning of President Obama’s first term in 2009. President Obama has named Deputy Secretary Sloan Gibson to serve as acting secretary until a permanent replacement has been found. “This morning, I resigned as secretary of veterans affairs. My personal and professional commitment and my loyalty to veterans, their families, and our survivors was the driving force behind that decision. That loyalty has never wavered, and it will never wane. “Over the course of the last five-and-a-half years, you have made significant and lasting progress in expanding access for veterans, in significantly decreasing the backlog in veterans’ claims while building the system that will end the backlog in 2015, and in bringing an end to veterans’ homelessness. “We have come a long way together in bringing this department into the 21st century in ways that will serve veterans well into the future. Yet, there is more work to be done, and I have no doubt that you will achieve all that you set about doing in the interest of veterans. “I have been privileged to have served as your secretary and am deeply grateful to the employees and leaders who have placed the interests of veterans above and beyond their own self-interests; who are serving with dignity, compassion, and dedication; and who live by VA’s core values of integrity, commitment, advocacy, respect, and excellence. “I know that you will provide your support and loyalty to Acting Secretary Sloan Gibson, who is now your leader. In fact, I expect it. Only two days earlier, Shinseki had given an update on steps he was taking to address the crisis: “I respect the independent review and recommendations of the Office of Inspector General (OIG) regarding systemic issues with patient scheduling and access. I have reviewed the interim report, and the findings are reprehensible to me, to this department, and to veterans. I am directing that the Phoenix VA Health Care System (VAHCS) immediately triage each of the 1,700 veterans identified by the OIG to bring them timely care. “I have already placed the Phoenix VAHCS leadership on administrative leave, and have directed an independent site team to assess scheduling and administrative practices at the Phoenix VAHCS. This team began their work in April, and we are already taking action on multiple recommendations from this report. “We will aggressively and fully implement the remaining OIG recommendations to ensure that we contact every single veteran identified by the OIG. I have directed the Veterans Health Administration (VHA) to complete a nationwide access review to ensure a full understanding of VA’s policy and continued integrity in managing patient access to care. Further, we are accelerating access to care throughout our system and in communities where veterans reside. Hirono had previously questioned Shinseki directly during a hearing of the Senate Veterans’ Affairs Committee on May 15. This week, Hirono met with veterans in Hawaii, including hosting a roundtable in Aliamanu. Rep. Colleen Hanabusa, a member of the House Armed Services Committee: “I personally appreciate Gen. Shinseki’s unshakable commitment to our country and want to thank him for his decades of service. As I’ve said, the decision of whether and when he should resign as secretary of veterans affairs was between him and the president, and I think this simply got to the point where he felt that he was a distraction from the pressing need to address the serious, systemic problems facing the VA.
“I know that Gen. Shinseki is driven by both a commitment to serving our veterans and a desire to maintain the public trust. He is guided by the question, ‘What is in the best interest of our veterans?’ I think that while he would have liked to have been the leader who fixed the problems at the VA, he also recognized that we needed a change in leadership in order to proceed effectively. In that light, I think his resignation today is not a sign of failure, but of the same humility and dedication that he has always displayed in his years of service to our country. I think America and Hawaii can be proud of him. Rep. Tulsi Gabbard, an Iraq War veteran: “Gen. Eric Shinseki is an American hero; he is a man of character and integrity, with a deep love and commitment for serving our country. Veterans everywhere, and the people of Gen. Shinseki’s home state of Hawaii, continue to have great love and respect for him and his service. 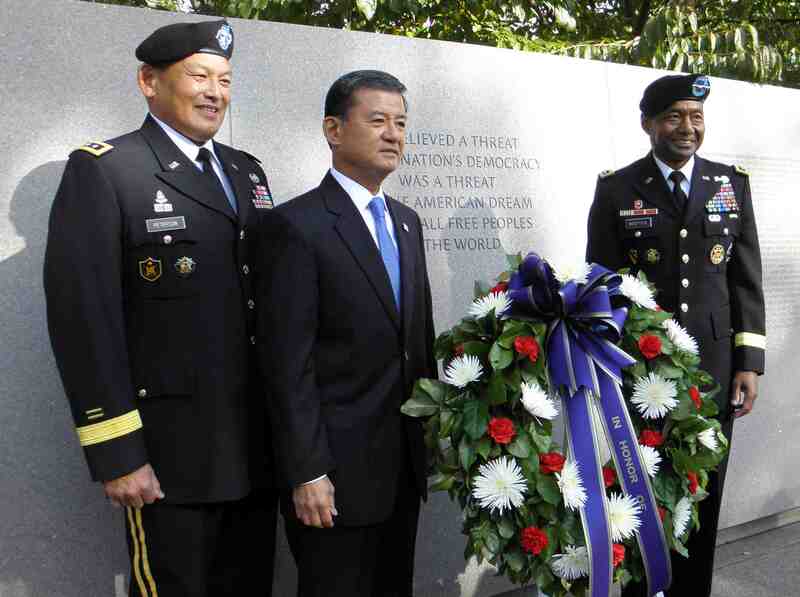 “But this day is not about Gen. Shinseki. This day is about all of our servicemembers and veterans, and the tragedy that has been occurring within the VA, an organization which has lost sight of its mission. Our loyalty, anger, and hurt must be focused on taking action to ensure that not another day passes where a veteran in need remains waiting in the dark. “We are facing a crisis, with veterans waiting months and sometimes years on official or secret waiting lists, while others are lost in the bureaucracy. This is unacceptable, and dishonors these great Americans who sacrificed so much. “I am currently drafting legislation that will ensure that veterans are immediately able to access care from a doctor, whether in the VA system or not. This is an urgent action that must be taken to begin to deal with the immediate crisis and ensure all veterans are getting the care they need. Another member of the Congressional Asian Pacific American Caucus, Rep. Mark Takano (D-Riverside), a ranking member of the House Veterans Affairs Economic Opportunity Subcommittee, said: “Gen. 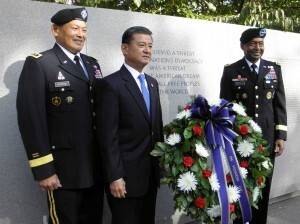 Shinseki has served his country for decades and I admire his dedication toward our veterans. But with the recent revelations that some VA facilities were hiding wait times and using secret wait lists, I believe that his decision to resign as secretary of veterans affairs will help the investigation, as it can now proceed without distraction. Rep. Ami Bera (D-Rancho Cordova), a physician, issued a statement on May 29 calling on Shinseki to resign: “Our veterans, and their families have sacrificed so much for our country, and they deserve our unwavering support. That’s why I have been working to address problems at the VA and to get our heroes the benefits they are owed since my very first month in office. “The latest report that at least 1,700 veterans in Phoenix were never even placed on a wait list to get the medical care they needed is deeply troubling. This cannot continue. It’s obvious there are very serious systemic and management problems at the VA that we must address. “While Gen. Shinseki’s dedication and service to his country are indisputable, these failures that happened under his leadership are unacceptable and it is clear that he must step down. Shinseki was the only remaining Asian American member of the Cabinet, following the resignation of Energy Secretary Steven Chu in April 2013 and Commerce Secretary Gary Locke’s departure in August 2011 to become U.S. ambassador to China. Duckworth, the first Thai American woman elected to Congress and the first Asian American elected to Congress from Illinois, has been mentioned as a possible replacement for Shinseki.